Using Avios on Cathay Pacific – Why it’s a Great Idea! Planning a trip to Asia or beyond? Today I thought I’d take a look at the benefits of using Avios on Cathay Pacific flights and why this may save you a considerable amount in taxes if booked correctly! Based in Hong Kong, Cathay Pacific offers a strong Business Class product and a First Class offering that is head and shoulders above the likes of British Airways. But these aren’t the only reasons for using Avios on Cathay Pacific – you can also save a considerable amount in taxes should you be prepared to fly via a European city such as Amsterdam or Dublin. Whilst we wouldn’t recommend redeeming flights for economy tickets (read my recent review on the value of an Avios point to find out why), if you’re a BA Executive Club Silver or Gold you’ll also be able to access Cathay Pacific lounges when flying in economy. The Cathay Pacific lounge at Heathrow’s T3 is considered by most to be far superior to the BA offering! 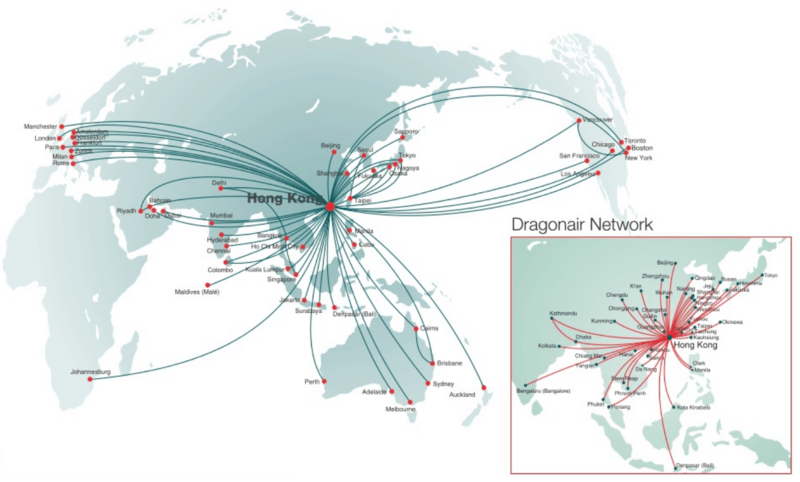 Below is an overview of the various routes flown by Cathay Pacific. Why Would You Want to Redeem? What are the best Credit Cards to Earn Avios for Cathay Pacific? Ok, so before I provide a step-by-step guide to using Avios on Cathay Pacific, I thought I’d highlight one of the main benefits of redeeming Cathay Pacific with Avios. Until recently airlines flying out of Hong Kong were restricted by law from charging surcharges on any flight that originated in Hong Kong. Unfortunately this is no longer the case, however you can still reduce taxes should you be prepared to fly via a European city. You’re able to redeem Avios points on Cathay Pacific because both BA and Cathay Pacific are members of the Oneworld alliance. However this does unfortunately mean you’re unable to redeem a BA 2-4-1 voucher (read my review of the BA Premium Card to find out why this is the most valuable credit card perk) on Cathay Pacific and as such you may only want to redeem Avios on Cathay Pacific if you’re travelling alone or have already used your 2-4-1 voucher. Let’s start by looking at redeeming a Business Class British Airways flight between London and Hong Kong to see what the difference in taxes could be! 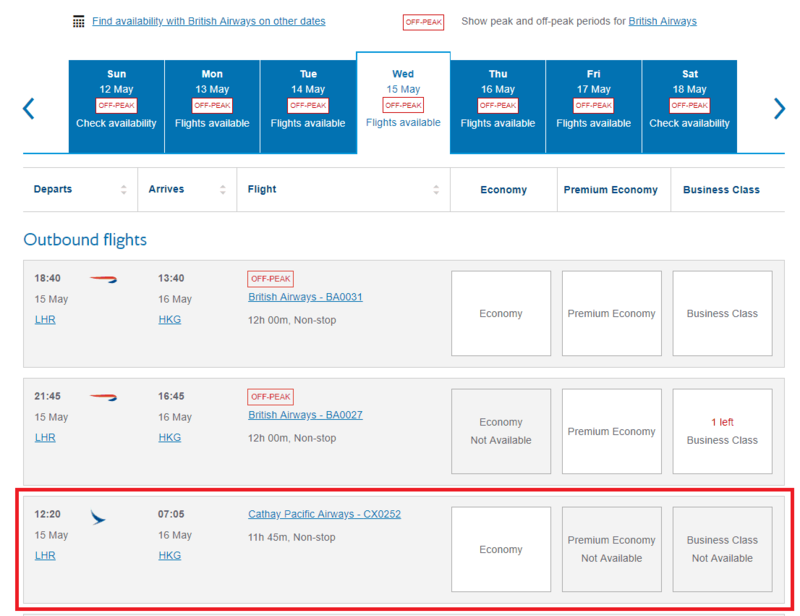 Now that we’ve seen that it’s cheaper to book 2 single tickets if you’re flying from the UK with BA, let’s compare this to an Avios Cathay Pacific redemption. There are two options when redeeming Avios on Cathay Pacific. 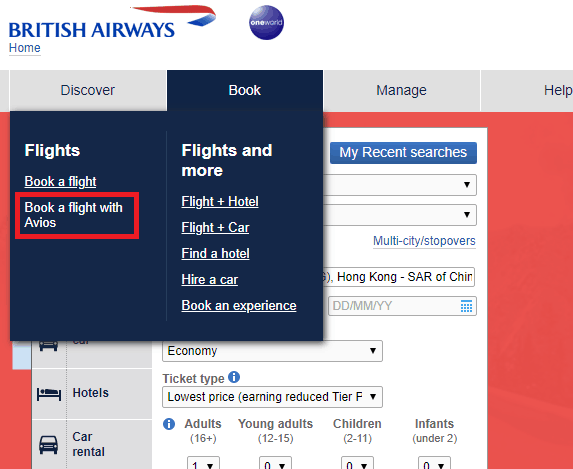 One is simply to redeem a flight from the UK to Hong Kong. Unfortunately due to the quality of the Cathay Pacific Business and First Class seats these can sell out quicker than BA! This means that the majority of people end up redeeming a flight from a European city instead. As we can see below this actually is a fabulous idea if you’re happy to fly indirectly. As can be seen above, by starting your journey in Amsterdam you’d only spend £78.50 in taxes. That’s a huge saving of £288.62 but also requires a further 15,000 Avios. Cathay Pacific do not differentiate between peak and off-peak pricing and as such you’ll always be charged the peak British Airways redemption rate. Don’t forget you’ll also need to position yourself in Amsterdam, which would require 9,000 Avios and £25 assuming you’d want to travel Club Europe (reviewed here) from London to Amsterdam. So for a further 24,000 Avios (during off-peak times) and an additional 3 hours of your time you could save £263.62 which would equate to 1.1p per point, which is acceptable. 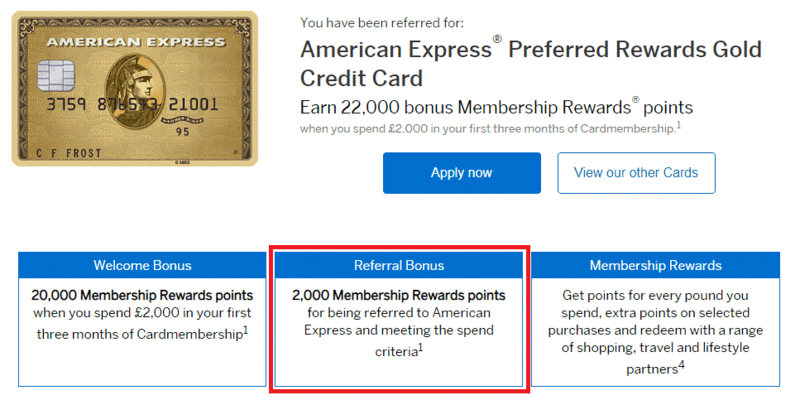 As regular readers will know, one of the easiest methods of earning Avios points in the UK is through the current sign-up bonus offered by the American Express Gold Card. The card is free for the first year and offers a sign-up bonus of 20,000 points when you spend £2,000 in the first 3 months. You can boost this to 22,000 by using this link. The card also comes with 2 free airport lounge passes which are always useful when you’re flying with a low-cost airline and you’d like to treat yourself! 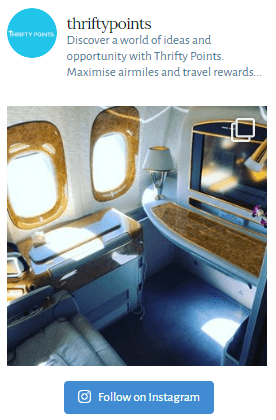 You can read how I combined the Amex Gold card and BA Premium card to earn enough points in one year for two First Class tickets – read my full review here which also includes a step-by-step guide as to how this can be achieved! Booking using Avios on Cathay Pacific is fortunately rather simple and is carried out like any other Avios booking. Step One: Log into your British Airways Executive Account on the BA website here. Then head to the Book tab and click on the ‘Book a flight with Avios’ highlighted in red below. Step Two: Then enter the details for the flight you’d like to search for. 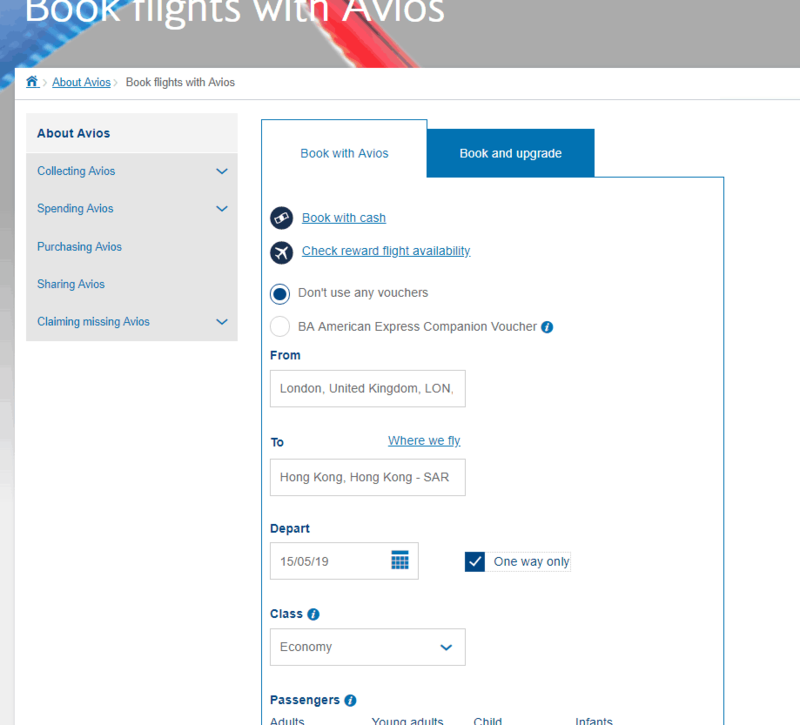 Step Three: The first options to appear will be British Airways flights so just scroll down and subject to availability you should be able to see the option to book a Cathay Pacific flight using those hard-earned Avios points. Step Four: Then just proceed to the booking page and book the flight as you would any other Avios redemption. Whilst it’s possible to use Avios on Cathay Pacific, strong demand for the Business and First Class seats means that there is rarely availability from London. HOWEVER, if you’re prepared to route through a European city there is excellent redemption availability and what’s even better is you could save well over £200 in taxes! Don’t forget that you can also save taxes on UK to Hong Kong return flights with BA by booking two single tickets as opposed to a return. Whilst routing through a European city is likely to require additional Avios points during off-peak dates, we feel that as long as the saving equates to more than 1p per Avios point (calculated by dividing the cash saving by number of additional points) this should be good value. Don’t forget that you can offset the additional Avios with the sign-up bonus of 20,000 Avios points with the American Express Gold Card (22,000 points using this link). At 1p per point, this sign-up bonus could be worth as much as £220. But don’t forget to cancel the card before the annual fee of £140 begins at the end of the first year!